I finished multicast this week with the workbook I labs. I still need to work out some more labs with it though. Hopefully I will get it all down after a few workbook II labs. I am hoping to finish up the QOS class on demands this week and move through the labs through the weekend. Then I want to quickly review some OSPF and EIGRP once more and back to the workbook II labs. I am still looking at July 14th at RTP for my lab attempt. I have four mock labs scheduled starting in April that will hopefully give me a good indication before I pay the lab fee :). I finished up the BGP labs from workbook I today and will continue on with Multicast tomorrow. I have to say I feel better about things after revisiting them again. Even if it slows my pace, what does it matter? I would rather go over the labs again from workbook I then move forward unprepared. I did use the Doc DVD along with the IOS Cookbook. I read the BGO chapter before I started the labs and was pleasantly surprised how well it broke everything down. There were good examples and excellent breakdown of the examples as well. This book is an excellent reference. There are no formal prerequisites for CCDE certification. Other professional certifications or training courses are not required. It is expected that the candidate will have an in-depth understanding of the topics in the exam blueprints, a minimum of seven years job experience, and a thorough understanding of networking infrastructure principles. Please view the written exam information page for more details. You must pass the two-hour, written qualification exam which covers advanced networking infrastructure design principles and concepts. Once you pass the qualification exam, you are them eligible to schedule the practical exam. Written exams are scheduled and taken at Pearson Vue, Cisco’s authorized testing vendor. Please visit the link below for more details and to schedule exams. Be sure to use the same candidate ID number for every exam that you take. If you use a different ID number, you will create a different record in the CCIE database and you will need to contact CCIE support for help in merging the records. The CCDE practical exam is still in development, however it will be an eight-hour exam that will test your ability to identify, manage, and create advanced solutions for large scale networks. You must pass the lab within three years of passing the written exam in order to achieve certification. There are a few labs in workbook one that I will be going over again this week. The first will be BGP and then Multicast. I am hoping to have the BGP labs done along with the multicast done by the end of the week. That will leave me with QOS for the weekend, but I want to go over the CODâ€™s again before hammering out QOS. One thing that was suggested to me by a reader was to look over the lab as I go over the topic through the COD. The labs for workbook one seem to follow the lectures closely and help give you a better idea. Hopefully this all helps. I also had another reader tell me not to worry about my work done on Lab one from workbook two. That I will always have gaps going between workbook one and workbook two. Hopefully though I can close a lot of the easy gaps. I broke out the topics I feel I need more work on and started from there last night. I just needed a few days away to relax and reform so to speak. At this point I am not going to purchase any other lab books. I will just revisit the topics on the cod’s and workbook I from Internetwork Expert and go from there. Well after midway through lab once of the IE workbook II I realized my foundation is weak at best and I was way over my head. In reading Ethan’s post on “How Ready am I?” I came to realize I still have the time to step back and do what he said he wishes he did. Start off with smaller labs in the beginning. IÂ did a bunch of the Internetwork workbook I labs, but I rushed through them, eager to start workbook II and get ever so closer to the prize. Now I see my fatal flaw and mistake. I am not ready for workbook II. I made it through a good portion of the workbook but when it came to the BGP portion and further I realized I am not ready. I need to go back and work on the foundation some more. I need to realize I might not be ready for the lab in July and I might need more time with our baby on the way. A ton needs to be done around the house for the arrival. I had a suggestion from someone of buying and trying Narbik’s “The Foundation” workbook to help close the gap. It is only $295 which is $400 less than what it used to be through ccboot. I will have to think on it. If anyone has used it and has an opinion on it let me know! I honestly can say I am not ready to go back and sit through all the Internetwork Expert COD’s some more. I honestly feel at this point that I didn’t pull much out of them the first time. I need to buckle down and read some more for sure. One thing is forÂ certain though, I am someone who needs to work out topics as I do them. I cannot sit and watch someone else go over topics and pick them up. 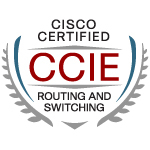 I wish I didn’t wait a year after my CCNP was complete either to start my CCIE studies. I feel like I forgot an awful lot and my brain is screaming in protest to have to go back to some topics once more. Well I am I upgrading my 3550 switches at the moment to get a good image on them. The image I had on them must of been corrupt orginally. Right now I am on the EIGRP section of the lab. It was a SLOW go this afternoon. So many things I forgot, so many times I was totally discouraged. So many time I was thinking “How am I going to pull this off?”. I accidentally closed out my dynamips without saving my configs, so I had to start the lab over. After I left the house for an hour and came back to start over it took me a lot less time to get everything configured. More importantly though I started to understand everything I was doing the second time. Not sure how many times I read the OSPF network types and couldn’t get it to sink in until I did it twice again this morning. I guess the biggest thing I took away from this was that hands on with these labs helps make everything so much clearer. I still have a ton of work ahead of me though. Well tomorrow starts my lab preparation with lab one from workbook two. I just got done loading the switch configs and configuring my net file for dynamips. I fired it up and all is running great. I should be good to go for tomorrow. I know it is going to be a crawl at first with trying to figure everything out and such. I see this lab as being a great learning tool. I will be in no hurry as I will be trying to learn more rather than trying to just get it finished. I guess even Leopard and it’s BSD base foundation needs to be rebooted after a few weeks of running Dynamips. I had trouble with R5 and R6 seeing the bridged out connections to the 3550’s. I sat there troubleshooting the physical connections and the network settings in Leopard. I removed the usb cables and added them back and the whole system locked up. I feel pretty good that I actually got Leopard to crash :). I should probably shut down the Dynamips session when I am done with that lab instead of leaving it to run for three weeks nonstop. Once I got the system back up all the bridged out connections were running correctly again. Also for those that do not know, you can save your running configs as well in Dynamips. First you need to do a “copy run start” on all the routers and then in the Dynamips console do a save /r1 r2 r3 etc… This will save the configs so next time you start your net file up it will ask you if you want to load the save configurations you have. I have separate configurations lines in my .net file that I comment out depending on which labs I am doing. That I find Multicast and QOS extremely boring and want to hurt little animals after going over them? I will admit some of this stuff I find very hard to read and concentrate on. I did finish up my BGP labs and I’m working on the Mulitcast ones right now. I had a few issues with the lab yesterday as well so that limited my time going through them. Scott V on CCIE Lab Passed!